Tony Stewart was in no mood to celebrate after he won Saturday’s DRIVE4COPD 300 Nationwide Series race at Daytona International Speedway. 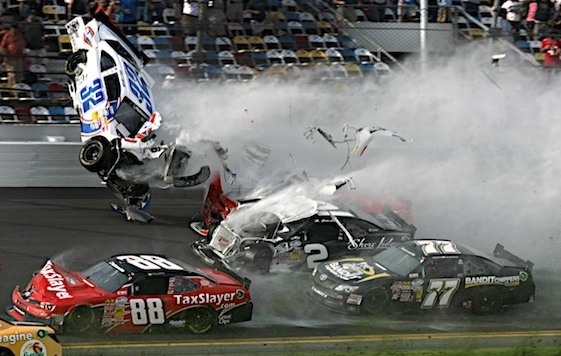 Not with 14 fans injured and being transported to medical centers as a result of a last lap crash that sent the car of Kyle Larson flying into the catchfence near the start/finish line. The wreck tore Larson’s car in half. The engine ended up on the grandstand side of the concrete retaining wall. A tire flew up further into the grandstand. More debris and hot liquids from the engine showered the area around the place where the car struck and ripped a hole in the fence. During a press conference early Saturday evening, NASCAR and track officials announced that they could not comment on the severity of the injuries to fans and had very little to say about the incident. As Stewart dodged the crash and crossed the finish line, the front clip of Larson’s car sheared off, ripping the engine out of its compartment. The front suspension and engine ended up on the walkway at the bottom of the stands. Regan Smith led as the cars approached the checkered flag, but Smith tried to block Brad Keselowski, who was running second, and turned across the nose of Keselowski’s car. Smith said he wasn’t about to surrender the victory to Keselowski 200 yards from the finish line. “We made a move to try and win the race,” Keselowski said. “We were in the catbird seat. Regan was in a good spot. He was first and I was second, and we were pushing. I kind of had the run and the move to win the race, and Regan obviously tried to block it, and that’s understandable. Sam Hornish Jr. crossed the stripe in second place, followed by rookie Alex Bowman, Dale Earnhardt Jr. and Parker Kligerman. The emergency in the grandstand tempered Stewart’s fifth victory in his last six February races at Daytona and the 11th Nationwide Series win of his career. 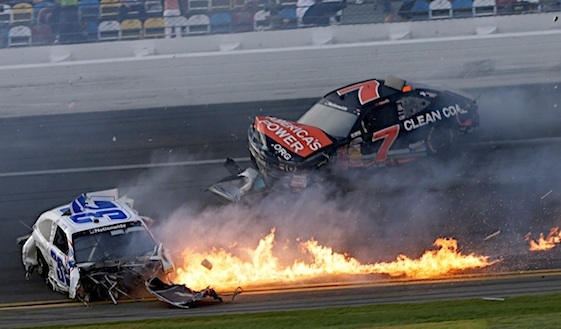 “Fortunately, with the way the event’s equipped up, there were plenty of emergency workers ready to go, and they jumped in on it pretty quickly,” NASCAR president Mike Helton told ESPN. “And right now, it’s just a function of trying to determine what all damage is done. Larson climbed from his car almost immediately and was evaluated and released from the infield care center. In addition to the 14 fans who were transported to local hospitals, 14 more were treated on-side. Having seen the footage of this accident, there are several worrying aspects.At the time of writing it is unclear whether there have been any fatalities, but it appears there are some critical injuries. The safety fencing obviously gave way, which allowed the engine, wheels and various pieces of the car to get into the spectator area, which must be of tremendous concern. The wire fencing and poles just did not appear to be up to the job of containing flying race car pieces. Presumably the fencing is built to NASCAR’s safety standards, which suggests that these parameters are simply not good enough any more. The fact that the car broke in two, especially as it was built to the new specification, is alarming. Maybe it was one of those freak impacts, but surely structural integrity is fundamental to any race car design, especially one where accidents are expected to be part of the action. Unlike Grand Prix circuits, where the spectators are a long way from the action and separated from the circuit by safety fencing and large areas of either gravel traps or tarmac, the very essence of NASCAR is that the fans get a close-up view of the action. However, is this is to be at the cost of injury or loss of life, then the sport needs to take a long, hard look at its speedway design and safety precautions.